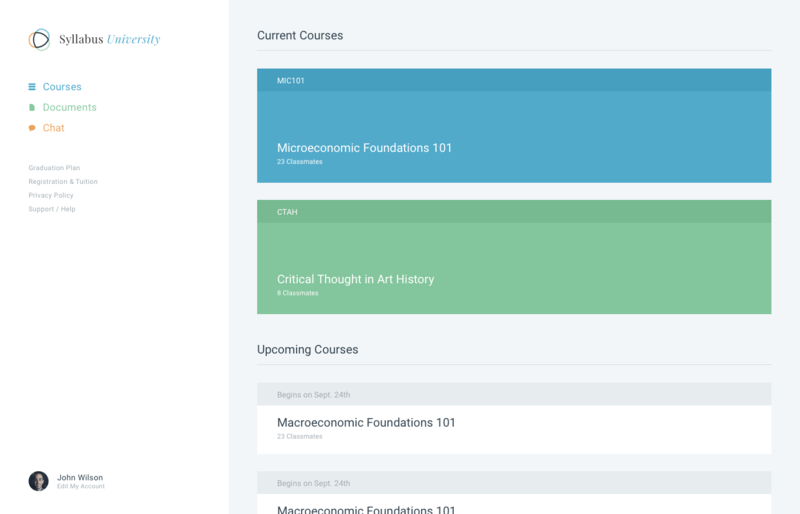 Syllabus | The best LMS for higher education. The first LMS built exclusively with higher education in mind. With Syllabus, any higher education institution can create multiple online degree programs with ease and simplicity. Coming soon. Sign up to receive platform updates. Who is Syllabus built for? With Syllabus, students focus on a single task at a time, thereby limiting distractions and helping them succeed. They can also manage their registration, tuition and other miscellaneous items from within their account settings. Because students manage their own accounts, no more unneccessary paperwork or time spent reviewing errors. Syllabus takes care of it all so that you have time to focus on more important issues. Syllabus automates grading tests which saves teachers time and allows them to focus on other more important issues. Teachers also get to continue teaching in the manner thay prefer with dozens of assignment types. Sign Up Send us your email to speak to a representative and receive updates. © 2016 The Syllabus Platform, Inc. All right reserved.